Ginger is the gnarled, bumpy root of the ginger plant. It is extremely popular in both sweet and savory recipes. 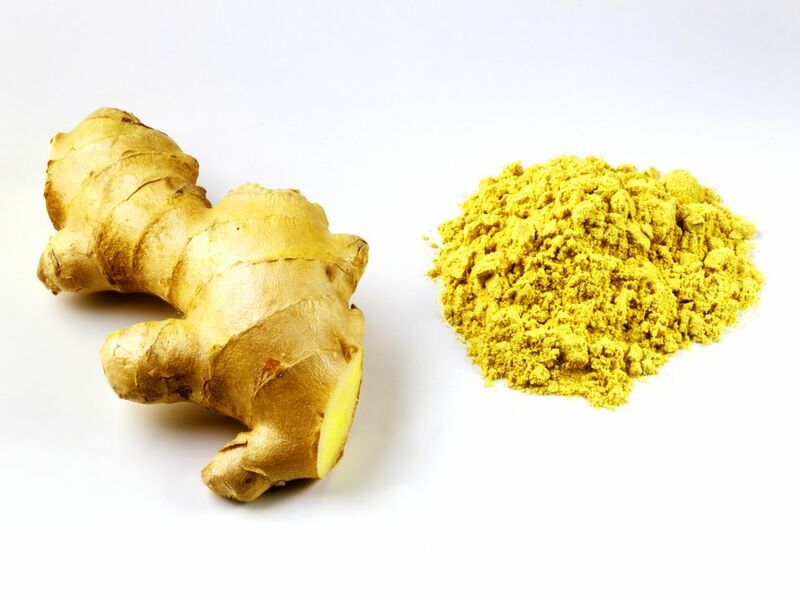 The flavor of ginger is peppery and slightly sweet. It has a pungent and spicy aroma. Keep in mind that fresh ginger, much like garlic, mellows with cooking, and turns bitter if you burn it. The ground form has a different flavor, which is most commonly used in sweet desserts and is not normally interchangeable with fresh ginger. Zingiber officinale, belonging to the same family as turmeric and cardamom. Its current name comes from the Middle English gingivere, but ginger dates back over 3,000 years to the Sanskrit srngaveram meaning "horn root" with reference to its appearance. In Greek it was ziggiberis, and in Latin, zinziberi. Fresh young ginger, also known as spring ginger, requires no peeling. It is available in Asian markets in the spring. Fresh mature ginger is available in the produce section of most markets year-round. Dried and crystallized ginger is readily available in the spice section. Fresh ginger can be found in the produce section of most grocery stores. Look for smooth skin with a fresh, spicy fragrance. Tubers should be firm and feel heavy. Length is a sign of maturity, and mature rhizomes will be hotter and more fibrous. Avoid those with wrinkled flesh, as this is an indication of aged ginger past its prime. There are many varieties of ginger root. The most sought-after has a light brown skin, with creamy yellow to light green flesh. Ginger comes in many forms including fresh, dried, pickled, preserved, crystallized (or candied), and powdered or ground. Fresh, unpeeled root should be wrapped in paper towels, placed in a plastic bag and refrigerated up to three weeks. It can also be tightly wrapped and frozen up to two months. Dried ginger should be kept in a cool, dark space in an airtight container. Pickled and preserved ginger should be kept in their original containers in the refrigerator. Store crystallized ginger in an airtight container in a cool, dark place for up to three months. Queen Elizabeth I of England is credited with the invention of the gingerbread man which became a popular Christmas treat. Ginger is an excellent natural remedy for nausea, motion sickness, morning sickness and general stomach upset due to its carminative effect that helps break up and expel intestinal gas.